The purchase of a coin or card operated laundry can truly be a great investment. Compared to other more traditional investments (ie. stocks, bonds), laundries can offer a significantly higher return with the added bonus of tremendous tax benefits. Similarly, compared to other more entrepreneurial investments (ie. restaurants, liquor stores), laundries can offer comparable meaningful returns, but with a more passive involvement. Look for a store that has been poorly operated. Your “sweat equity” will be able to improve the cleanliness and efficiency of the store operations. You should be able to buy this store at a value (ie, at a lower multiple than stores with a similar net income, but in better condition). Look for a store that has been maintained properly. You would probably feel more comfortable in buying a store from an owner who keeps meticulous records of income and expenses. Depending on the age of the equipment and the quality of the lease, you may end up paying a slight premium on this type of store. You won’t be happy unless you have a store that is personalized. Look for a large customizable laundromat. It may take building a store from scratch to satisfy your needs. If you want complete control, consider buying the real property as well. While equipment age and quality is important, you may be able to find value in buying a store with equipment in poor condition. If you believe there is a significant upside in the store if the equipment was in better shape, try to buy the store inexpensively and spend some time and money on repairing the equipment. Look for a store where the equipment has been well maintained. Seek a professional to view the store to provide an analysis of the equipment. You are looking for stable, consistent returns; thus consider replacing some equipment to reduce repair headaches and utility bills and to enhance income. You want to install the latest in equipment and payment system technologies. Do your research on manufacturers and payment systems that fit your specifications. You could consider attended and unattended stores. If you plan on spending considerable time at the store the effectiveness of the current attendant is not overly important. It can be a benefit to find a store with a stable attendant. If the attendant is solid he or she will be able to let you hit the ground running. Their knowledge of the community and customer base is an asset. You are going to want your store to be fully attended. You are going to focus on being a better operator than your competition, so make sure to find quality attendants and train them well. You should always seek as favorable a lease as possible. If there is already a solid lease in place, great. If not, sell the landlord on you being a hands-on operator and try to negotiate more favorable lease terms. You need to make sure that you have a solid lease to protect your cash flow. Things to look at are: length of term, current rent, amount and frequency of increases and assignability of lease and options. Look for a long-term lease or a property you can buy. If leasing, look for: length of term, current rent, amount and frequency of increases and assignability of lease and options. 1) What is the current cash flow of the laundromat? 2) How collateralized is their loan (newer equipment = better collateral)? 3) How strong is the borrower? 4) Does the laundromat’s lease allow for the cash flow of the store to continue for the length of the loan term? Assuming a stable cash flow and relatively new equipment, a lender may consider a loan between 50-60% of the purchase price. Installing new equipment in a laundromat allows a lender to have more collateral to support their loan. On new Laundromats, lenders may loan 60-70% of the total purchase price, at very favorable interest rates. In certain situations, SBA financing may also be available. 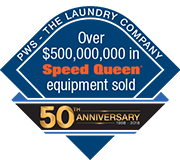 Here are some great articles to read about things to consider when buying an existing laundry, or looking for the right site to build a new laundry.